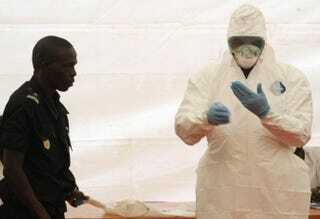 A Senegalese hygienist demonstrates how to protect oneself against the Ebola virus on April 8, 2014, at Dakar airport, during a visit of the Senegalese health minister to check the safety measures put in place to fight against the virus’ spread in western Africa. A patient infected with Ebola is expected to be flown into the United States to be treated in Atlanta at Emory University Hospital, Reuters reports. The patient, a U.S. aid worker who contracted the disease while working in West Africa, will be moved to a high-security ward and kept in a special isolation unit that was set up in collaboration with the hospital and the Centers for Disease Control and Prevention, according to the news wire. Reuters has not named the patient, but CNN is reporting that two American aid workers who were infected while working in Africa—Dr. Kent Brantly and Nancy Writebol—would be returning to the U.S., and at least one of them would be going to Emory. Both Americans contracted the disease while working on behalf of the relief groups Samaritan’s Purse and SIM, according to CNN. The CDC has confirmed that the agency was working with the State Department in the patient transfer. CDC spokeswoman Barbara Reynolds told Reuters that to the best of the organization’s knowledge, no one with Ebola has ever been treated in the U.S. According to Reuters, White House Press Secretary Josh Earnest did confirm that the State Department was collaborating with the CDC to evacuate American aid workers. The disease has already taken the lives of more than 600 across West Africa, mostly infecting the areas of Guinea, Liberia and Sierra Leone. Dubbed one of the worst outbreaks in history, the still-incurable virus has about a 60 percent fatality rate.